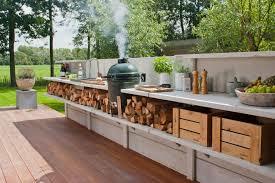 Created by designer Piet-Jan van den Kommer; WWOO is the outdoor kitchen, spa or boundary. It could be 1,30 meters or 2 meters high, and as long as you want. The WWOO can be suplemented with numerous wannahaves. The WWOO is available in anthracite and grey concrete. A WWOO is virtually maintenance-free and affordable. The personalized outdoor kitchen comprises of various kinds of components, which will give you the freedom to incorporate your own ideas.